The MTA's 2015-2019 Capital Program sets aside money for a new Avenue A entrance to the First Avenue L stop. 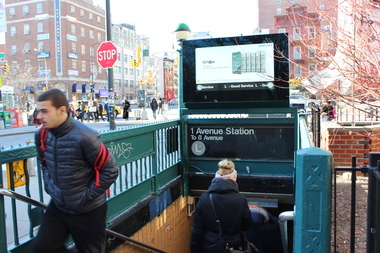 STUYVESANT TOWN — Straphangers at the the First Avenue and Bedford Avenue L stops may finally get some relief with the approval of the MTA’s new capital budget — which gets the ball rolling on the construction of a new entrance at 14th Street and Avenue A and a new staircase at Bedford Ave. The agency approved its 2015-2019 Capital Program on Oct. 28, setting aside $40 million for the improvements at both stations, and another $59.1 million to make the First Avenue station ADA compliant. The new entrance for the First Avenue station is meant to relieve congestion at the stop, which currently only has one point of egress at 14th Street and First Avenue. An average of 24,286 riders pass through the station each weekday, according to MTA's website. The Bedford L train station sees 27,224 riders per weekday. Garodnick, a resident of Stuyvesant Town, praised the project for its potential to make the rush hour less of a nightmare. The MTA announced last year that it was looking to add a new entrance at 14th Street and Avenue A, and that the project would be the first in a list of capital projects along the Canarsie Line. The agency would not provide a timeline for when any of the construction would begin.